How often are children told to wash their hands or drink lots of water? Probably pretty often. Many have easy access to swimming pools, fountains, fresh water lakes, some even have the ocean right in their backyard. Unfortunately it’s a sad reality that accessible clean water is a luxury to many parts of the world. So how do we teach young people to appreciate such a valuable resource when their accessibility to water is literally at the turn of a tap? You let them discover the journey. 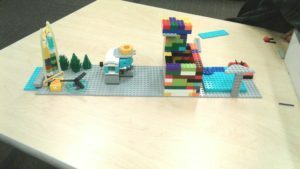 In FIRST® LEGO® League Jr., students learn about a very special outdoor play apparatus in South Africa called a PlayPump. In the communities where these were built, children are able to play on this practical merry-go-round that pumps water out of the ground and into a holding tank. From there, a tap can be opened so the community can access this clean water supply when needed. Students find out the benefits of this invention, and also the challenges that it faces. Furthermore, they learn that this isn’t a one step process. 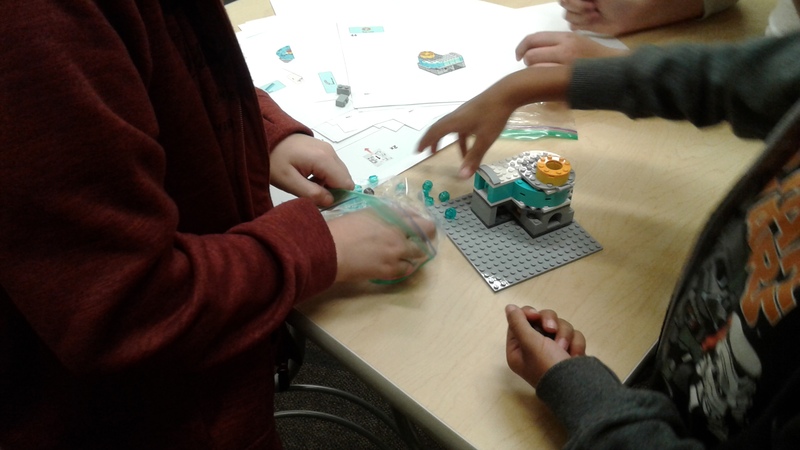 In conjunction with their Inspire Model (a LEGO Water Pump), students build the different stages that water travels in order to get to where it can be used. Next on their Aqua Adventure, students will choose a water use that they’ll focus their team model around! Are you interested in becoming a coach or mentor? 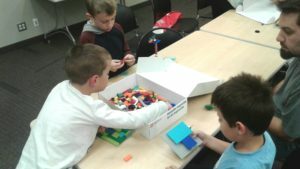 It’s not too late start a FIRST LEGO League Jr. team. Email us at mentors(Replace this parenthesis with the @ sign)frcwest.com today! Today’s edition of FRS Education Series is the first of a two part session on strategy. These two sessions will be covering off Strategy as it primarily relates to FRC and FTC. The first half of today’s session will be focused on, after the game reveal, how do you get started? How do you put together a design and build strategy to achieve your goals? The second half of today’s session is focused on a commonly overlooked but critical aspect to game play: scouting. What are the different types of scouting, what to look for when scouting and how to use this valuable information. The next Strategy session will focus on game and match strategy as well as the role of the drive team. Join our Calgary Electronics Class! FIRST Robotics Society, its Student Board, and BusBoard Prototype Systems (www.BusBoard.com) are hosting a day-long basic electronics class on Sunday Oct 15 at Bow Valley College, downtown Calgary. Space is available for up to 175 students. We are recording this event to use as a later webinar for off-site students (date TBD). The first half of the day will focus on basic electricity, wiring, and troubleshooting skills. 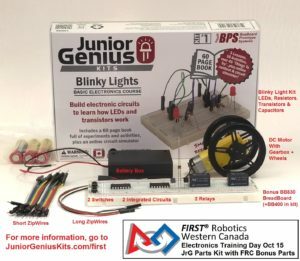 Each student will receive a Junior Genius Kit #1-Blinky Lights with 60 page manual which we will work through as a group. The presenter (Scot Kornak from BusBoard) will lead everyone through this hands-on course step-by-step with a powerpoint presentation, but each team should have a mentor or leader present to help students as needed. 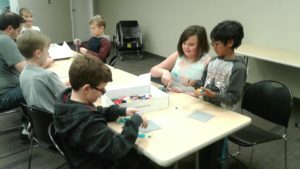 The second half of the day will explore how to connect circuits to a controller like the FIRST roboRio or a simpler controller like an Arduino or Teensy. These simpler boards may be used to add robot features (non-movement or control features, as per the rules). Various input and output circuits will be built to see how they work (without programming or connecting to an actual controller). 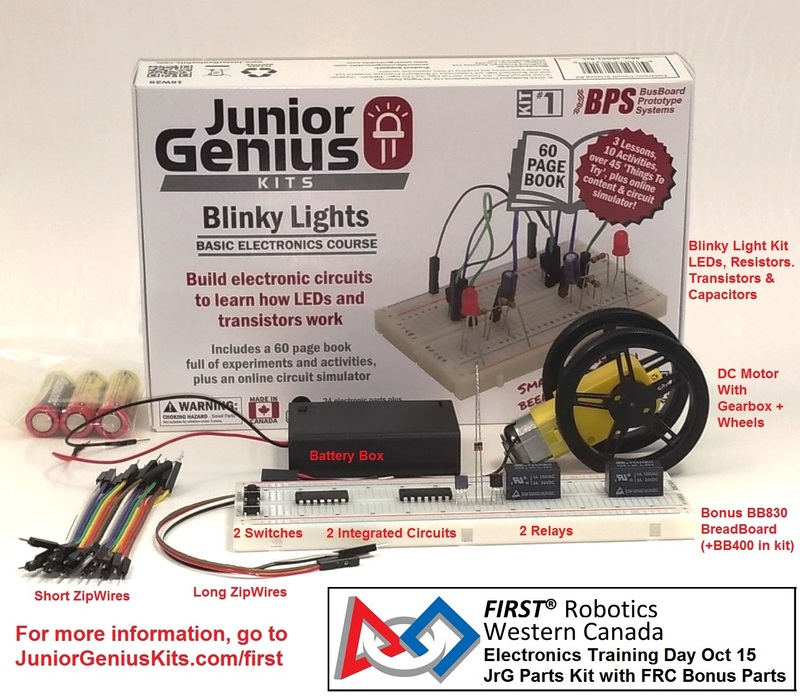 Cost: $30 CDN – Participants will receive a Junior Genius #1-Blinky Light kit (with breadboard and 60 page manual) and supplemental FIRST training day bonus parts including a DC motor with gearbox and wheels. Tickets are available through EventBrite to purchase spots for your team at this event. To get more information about the FRC/FTC training day, send an email to info(Replace this parenthesis with the @ sign)busboard.com and we’ll let you know further details when available. Note: Mentors and teachers may take a seat and work through the kit along with the students to get hands-on electronics practice. We highly recommend it if you haven’t assembled circuits before. Please buy the extra tickets on-line when you purchase tickets for your students. Getting pumped for the FIRST® LEGO® League Jr. 2017/2018 season? In the AQUA ADVENTURESM Challenge, more than 40,000 children will navigate the uncharted waters of this most valuable resource. 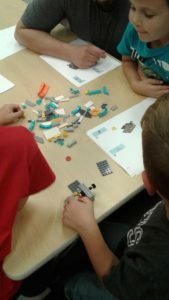 In British Columbia and Alberta we have a combined total 31 FIRST LEGO League Jr. teams. 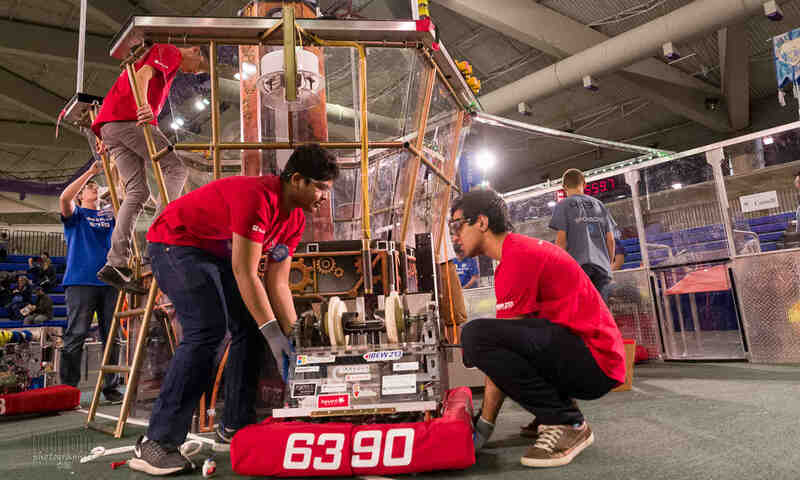 On behalf of FIRST Robotics Society of western Canada, I’d like to extend a very warm welcome to all, especially to those volunteers, mentors and coaches who without your contribution, this program would not be possible. FIRST LEGO League Jr. (FLL Jr.) is a non-competitive, hands-on, STEM based program designed for children ages 6 – 9. 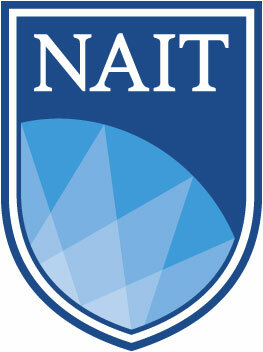 It is the first of four programs offered by FIRST. It sets the foundation for students to learn basic engineering and programming skills while igniting their creativity by using LEGO as their medium. Students are presented with a real world challenge and guided using research, critical thinking, teamwork, gracious professionalism and of course fun! 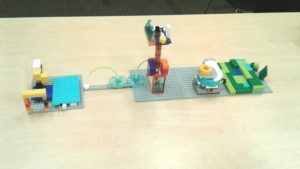 This week some of our teams learned about FIRST Core Values and built a LEGO water pump which they will incorporate into their final team model. This is sure to be an exciting season! Please stay tuned for more and don’t forget to follow us on our social media! The future of Science, Technology, Engineering, and Mathematical exploration is in your hands today! Make a difference to diversity and inclusion in STEM by attending the AWSN’s annual STEM Affair. By supporting this fundraiser you will be granting Alberta youth the opportunity to access any of the AWSN’s recruitment member programs to enhance their educational experience and get them excited about a career in STEM. At the STEM Affair you will be entertained by scientific displays and be treated to the address of the Keynote Speaker, Dr. Gina Cherkowski, the Founder and CEO of STEM Learning Labs. Be a part of this incredible night in support of diversity and inclusion in STEM.